German Renaissance may be said to have made its debut under Albrecht Dürer. There was already in many of the German cities a disposition to copy Flemish artists, but under Dürer's influence this new departure became developed in a high degree, and, as the sixteenth century advanced, the Gothic designs of an earlier period were abandoned in favour of the more free treatment of figure ornament, scrolls, enriched panels and mouldings, which mark the new era in all Art work. Many remarkable specimens of German carving are to be met with in Augsburg, Aschaffenburg, Berlin, Cologne, Dresden, Gotha, Munich, Manheim, Nuremberg, Ulm, Regensburg, and other old German towns. Although made of steel, the celebrated chair at Longford Castle in Wiltshire is worthy of some notice as a remarkable specimen of German Renaissance. It is fully described in Richardson's "Studies from Old English Mansions." It was the work of Thomas Rukers, and was presented by the city of Augsburg to the Emperor of Germany in 1577. The city arms are at the back, and also the bust of the Emperor. The other minute and carefully finished decorative subjects represent different events in history; a triumphal procession of Caesar, the Prophet Daniel explaining his dream, the landing of Aeneas, and other events. 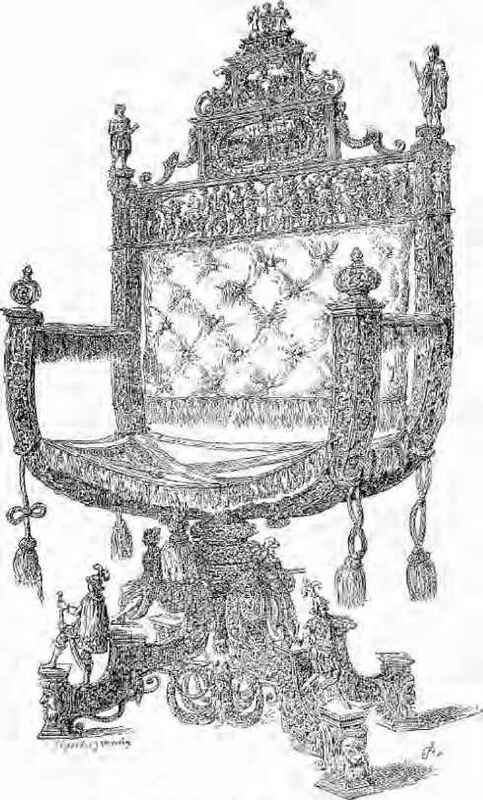 The Emperor Rudolphus placed the chair in the City of Prague, Gustavus Adolphus plundered the city and removed it to Sweden, whence it was brought by Mr. Gustavus Brander about 100 years ago, and sold by him to Lord Radnor. As is the case with Flemish wood-carving, it is often difficult to identify German work, but its chief characteristics may be said to include an exuberant realism and a fondness for minute detail. M. Bonnaffé has described this work in a telling phrase: "l'ensemble est tourmenté, laborieux, touffu tumultueux." There is a remarkable example of rather late German Renaissance oak carving in the private chapel of S. Saviour's Hospital, in Osnaburg Street, Regent's Park, London. The choir stalls, some 31 in number, and the massive doorway, formed part of a Carthusian monastery at Buxheim, Bavaria, which was sold and brought to London after the monastery had been secularised and had passed into the possession of the territorial landlords, the Bassenheim family. At first intended to ornament one of the Colleges at Oxford, it was afterwards resold and purchased by the author, and fitted to the interior of S. Saviour's, and so far as the proportions of the chapel would admit of such an arrangement, the relative positions of the different parts are maintained.